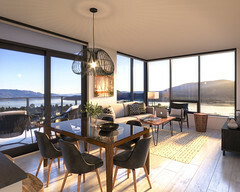 Brooklyn at Bernard Block(www.liveatbrooklyn.com) is Mission Group’s newest condominium development in downtown Kelowna. Situated just minutes from the lake on the old Bargain Shop lot, the building is inspired by contemporary Brooklyn architecture, bringing a taste of the Big Apple to the Okanagan. Featuring rooftop amenities and a mezzanine terrace, Brooklyn at Bernard Block is built with Mission Group’s Inspired Green approach in mind, which aims to lessen the builder’s environmental footprint in five areas: energy, water, air quality, recycling and climate change.